If you are looking for me in December, you will likely find me in my kitchen making fudge. I love to eat it. I love to make it, and I love to take pictures of it. I’d make it year round if my hips would not cry out in frustration from the extra calories. 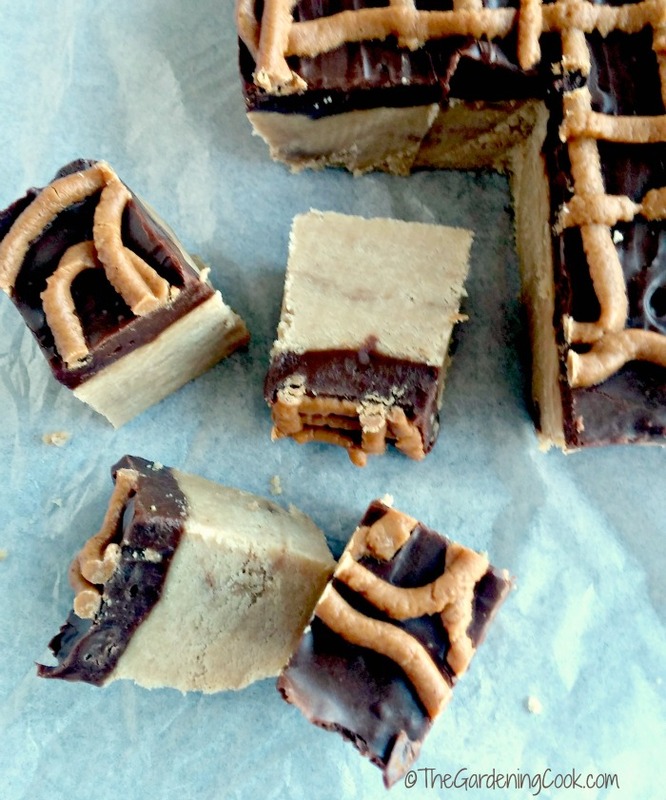 This drizzled peanut butter cup fudge is so easy to make and absolutely foolproof. This Reese’s peanut butter cup fudge is absolutely foolproof. There are ways to fix fudge that does not set. Basically, most fudge recipes require you to cook the fudge for a certain period of time so that the temperature is high enough to cause setting. But I am an impatient gal and I have no time for such rules, especially this time of the year. So when I find a way to make fudge that really is fool proof, I tinker with it in various flavors and exploit that nice little feature. When I say fool proof friends, I really do mean it. 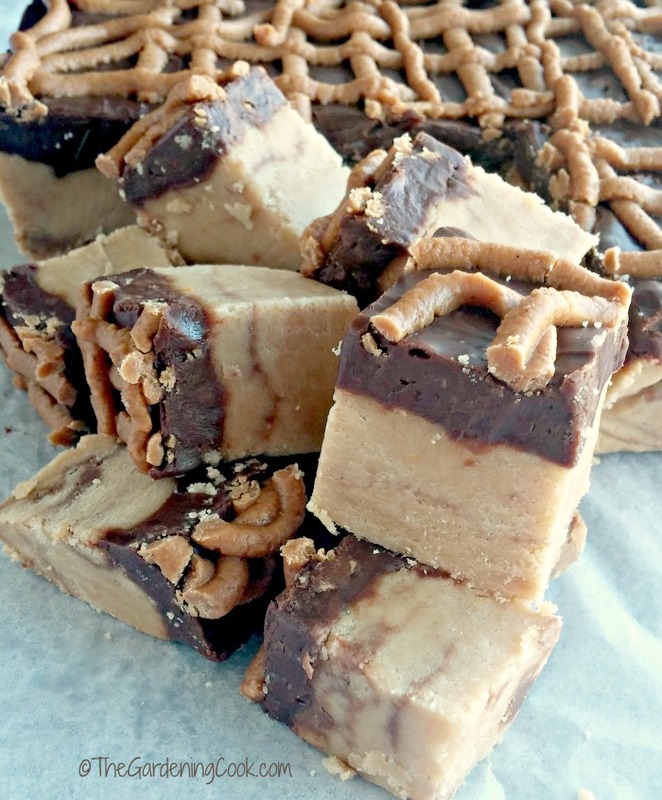 There is nothing you can do to make this fudge fail. Seriously. The fudge has everything you like in a tasty bite of goodness. Just look at these scrumptious things that go into it. The trick for making this set every time is the base layer. 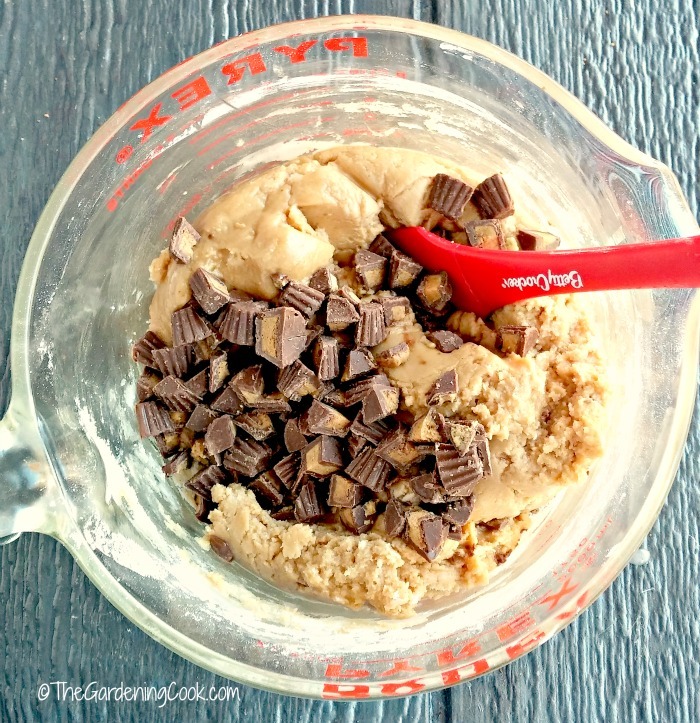 The butter, vanilla extract, and peanut butter is the perfect combination. it does not need a long cooking time. I softened it all in the microwave for all of one minute and then added the confectioner’s sugar. How easy is that? Then came the chopped up miniature peanut butter cups. I used the unwrapped minis and just chopped them into quarters. They get added to the peanut butter mixture and just folded in. The heat of the mix will make them melt just enough to give you some swirls in the fudge. I placed this in the fridge to cool and made the topping. For this fudge, I chose milk chocolate morsels. 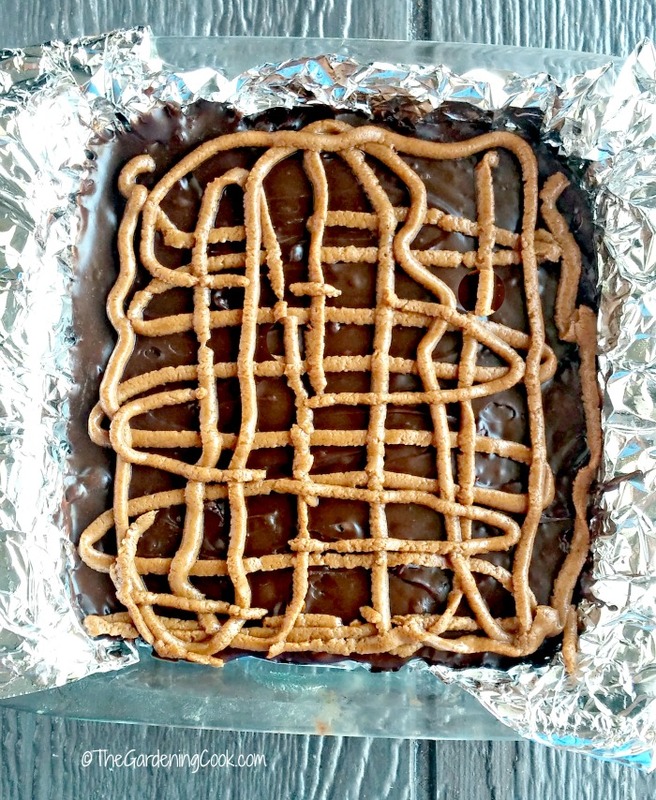 I’ve made a Buckeye version of this fudge with semi sweet chocolate for the topping but I wanted milk chocolate so this one would taste more like Peanut butter cups. Into the microwave with some butter and sweetened condensed milk for another minute and stir till smooth. I used a fat free sweetened condensed milk. Just trying to trick myself into thinking it is low calorie. It is not…by ANY stretch of the imagination, but it’s what I had on hand. Smooth this layer over the top of the peanut butter base and put it back in the fridge. The last step it to put the peanut butter morsels and 1 tablespoon of the condensed milk in the microwave for another minute and then add it to a zip lock bag. Cut off a small corner and pipe the peanut butter mixture over the top in criss-crossed lines. I made the hole in the baggie close to 1/4″ in size to give me wide piping lines so the peanut butter drizzle would be sort of substantial. Now it goes back in the fridge to allow it to set completely. It doesn’t take long. Mine was set in about an hour and ready to cut. The fudge is TO DIE FOR. 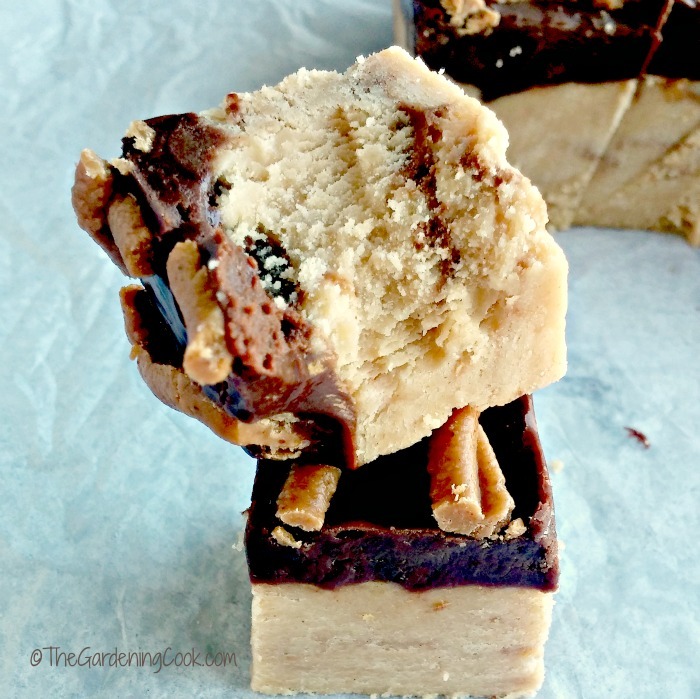 If you like peanut butter cups, this fudge will be one of your favorites. It is like a big ole square of Reese’s. Super tasty, creamy, with a crisp fudge like consistency. It melts in your mouth and satisfies in one bite. 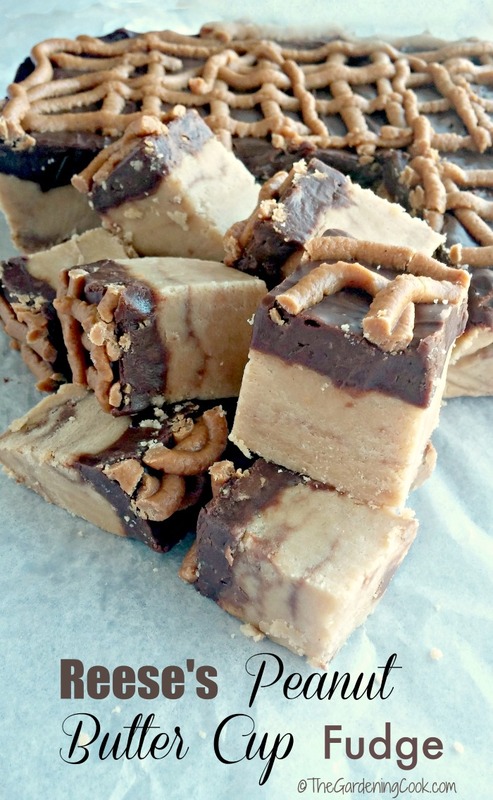 Homemade fudge makes the perfect food Christmas gift. It’s right at home on your holiday dessert table. Also, it freezes very well. That is a huge plus for me. Leave me alone with a whole pan of peanut butter fudge and I’ll be a very bad girl. Just sayin’. I freeze it and place it in tupperware containers and just take out one piece when I am in the mood for a bit of decadence. Are you as much of a peanut butter lover as I am? Do you have 5 minutes to spare? 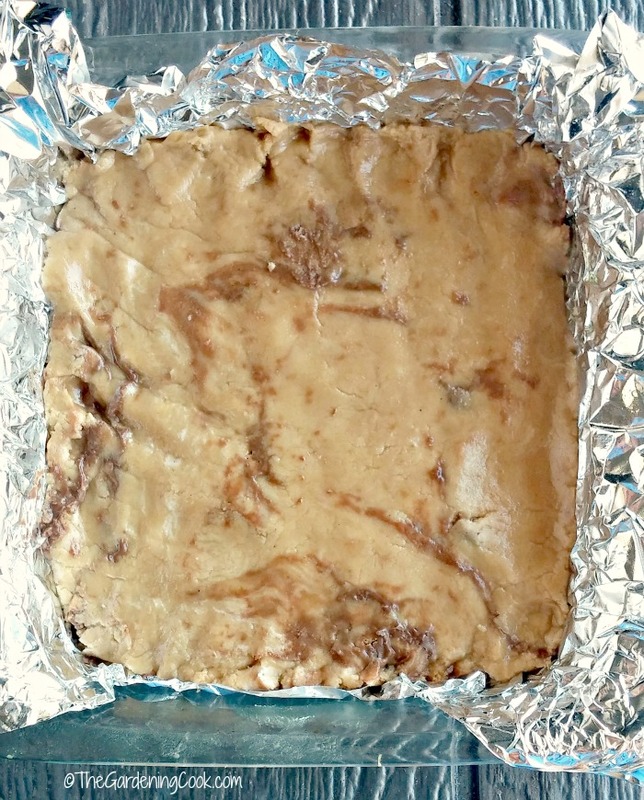 Whip up a batch of this scrumptious Reese’s peanut butter cup fudge. You will thank me, even if your hips do not! What could be better? A fudge that is rich, decadent and easy to make every single time. This recipe is a keeper, folks! 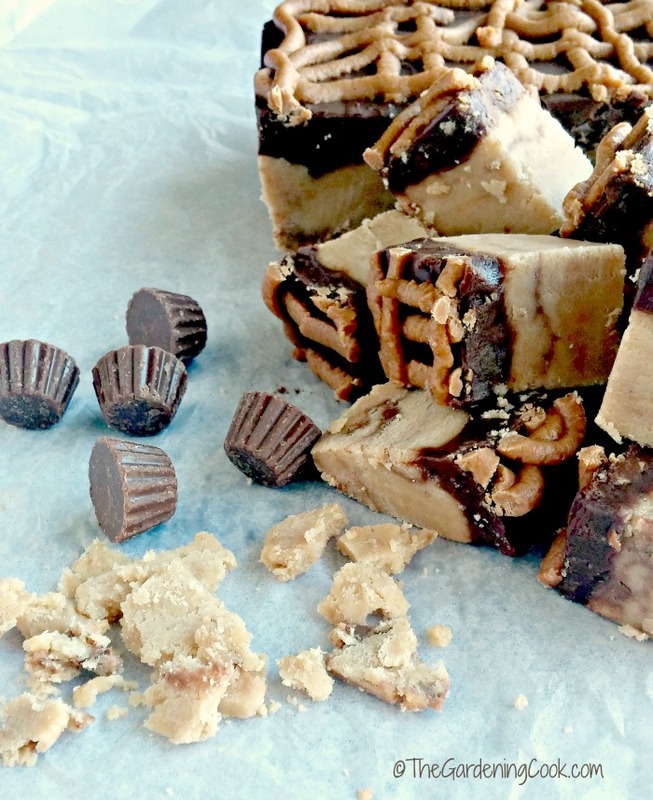 This Reese’s Peanut Butter Cup Fudge has everything that you want in a fudge recipe. It’s crumbly, peanut buttery, chocolately and deliciously tasty! Combine the butter and peanut butter in a microwave safe bowl for 2 minutes. Stir well and heat for another 2 minutes. Caution, the mixture will be very hot!! Using a wooden spoon, stir in the confectioner's sugar. The mixture will lose its sheen and be very crumbly. (sort of like a cheesecake crust.) Just keep stirring until everything is well combined. Place the pan in the fridge to cool while you make the chocolate layer. 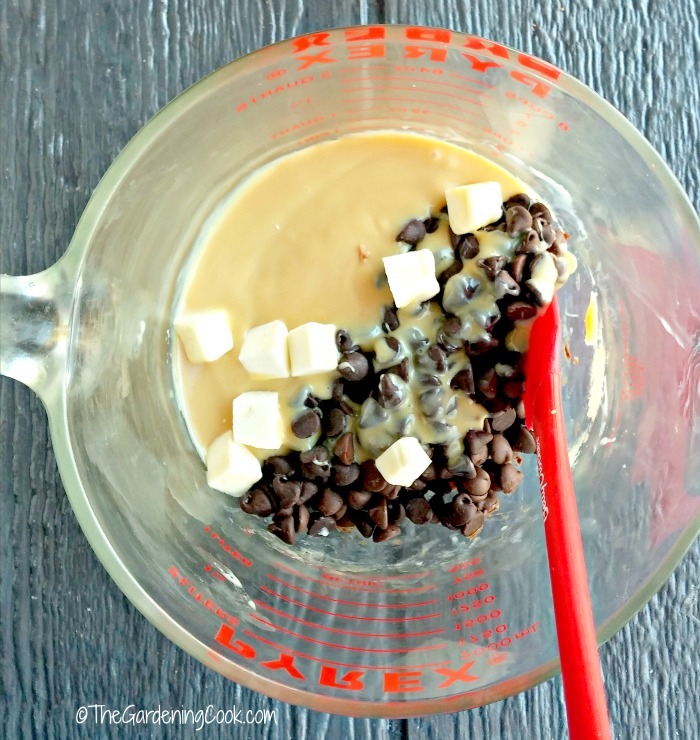 Combine the chocolate chips, skim milk and pure vanilla extract in a microwave safe bowl and heat in 30 second increments until is the chocolate has melted and is very smooth and silky. 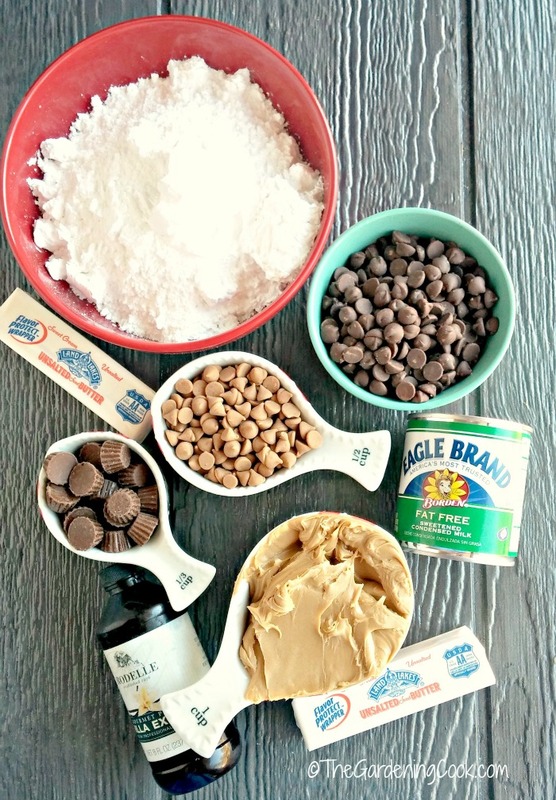 Pour the chocolate mixture over the peanut butter mixture and smooth so that the peanut butter is completely covered. Roughly chop the Reese's peanut butter cups. Sprinkle the chopped peanut butter cups over the chocolate layer and press slightly. Place in the fridge to cool for at least 2 hours until the chocolate layer has well set. Remove the pan and cut into about 30 squares. There are ways to fix fudge that does not set. Basically, most fudge recipes require you to cook the fudge for a certain period of time so that the temperature is high enough to cause setting.